Unlike other food allergies (e.g. milk, egg, wheat and soya), fish allergies usually start in adulthood and are never outgrown (become lifelong). Parvalbumins represent the second-largest animal food allergen family and are abundant in the white muscle of many fish species, where they have a role regulating free intracellular calcium levels, which are important for muscle functions. There appears to be no clinically relevant allergic cross-reactivity between shellfish and fish. Parvalbumins are the major allergen in fish species and tropomyosin in crustacean and mollusks. 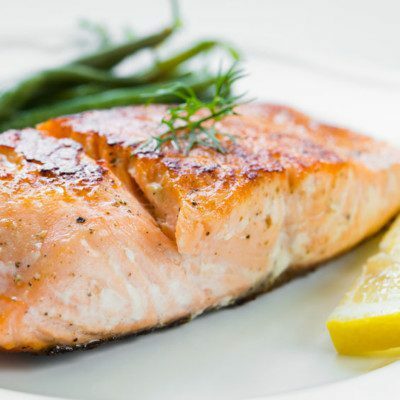 Fish allergens are generally considered to be stable to cooking and other thermal processing methods, with parvalbumin proteins being particularly resistant to acidic pH, heat denaturation/degradation and proteolysis. Fish allergens can be managed by excluding fish from the diet and always having proper medication available. People with fish allergies are advised to avoid consuming fish and anything that comes in contact with fish. In addition, people with fish allergies should avoid restaurants that have high chances of cross-contamination, such as seafood restaurants. Symptoms of fish allergies include tingling mouth and lips, gestational discomfort, rash, asthma attacks, and most severely, anaphylaxis. Anaphylaxis can be life threatening if not treated immediately with the use of epinephrine, and any other medication prescribed by a physician such as a rescue inhaler. Labeling of fish is regulated by the Food Labeling Consumer and Protection Act, which requires any packaged product be clearly labeled as “containing fish.” People with food allergies are recommended to learn the names of many allergen-containing fish so they won’t become confused when reading labels. Mills, C., Johnson, P.E., and Alexeev, Y. “Food Antigens” Food Allergy, Saunders, Elsevier Inc., 2012, pp. 15–32. Wong, G.W.K. “Detection and Control of Fish, Shellfish and Molluscs as Food Allergens” Handbook of Food Allergen Detection and Control, Woodhead Publishing, Elsevier Inc., 2015, pp. 379–387. Mills, C., Johnson, P.E., and Alexeev, Y. “Identification and Characterisation of Food Allergens” Management of Food Allergens, Blackwell Publishing Ltd, 2009, pp. 42–50.